Here is another fall work outfit. I absolutely love the blush colored infinity scarf! I got this down in a pheonix a couple years ago at a swap meet. Swap mart? Whatever they are called. We don’t have them here in Minnesota. I also have a mustard colored one I will have to showcase at some point. 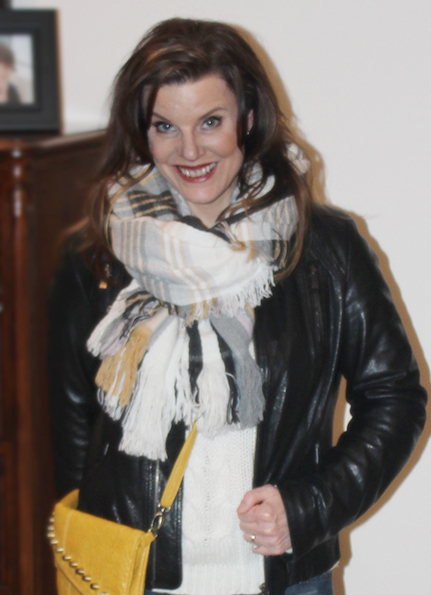 Mustard is also a good go to for fall. Anyways, the dark jeans are new this year. I actually wasn’t sure about the jeans when I first bought them. They were a bit tight. I think I’ve lost a few pounds cuz they fit good now. Funny how that happens. It’s either that or I’m not retaining as much water. Ha ha! I kin all you women reading this know what I’m talking about. We shall see going into winter if they still fit. The color of Jean wash is so great. They definitely got it right. It’s sophisticated and modern. 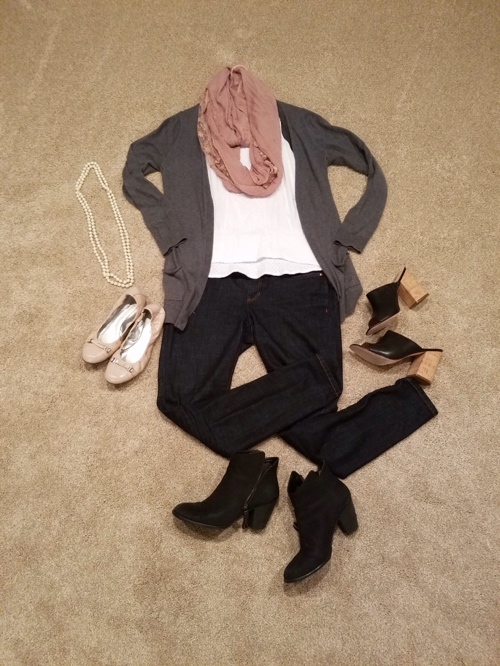 Pair the dark jeans with a white tee and gray cardigan and you can put whatever color scarf you want on top. Makes it easy to get ready in the morning. 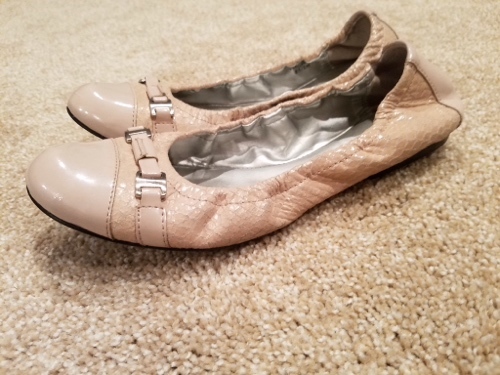 I have these lovely blush flats that match perfectly. The flats had some scuffing I them. If you are interested, rubbing alcohol gets all scuffs off of patent leather. They look almost brand new, minus the wear on the bottom. Ha! I pictured a few shoe options. 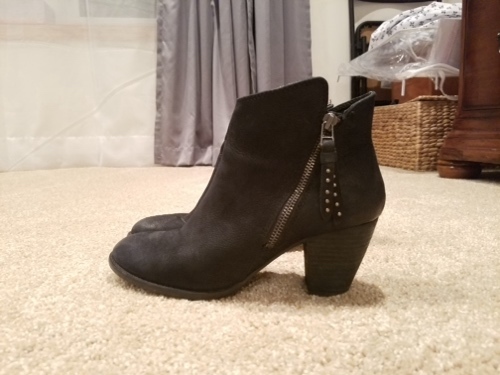 Short booties are always good when it gets a bit frigid. Or for a more modern look these tall mules could work. 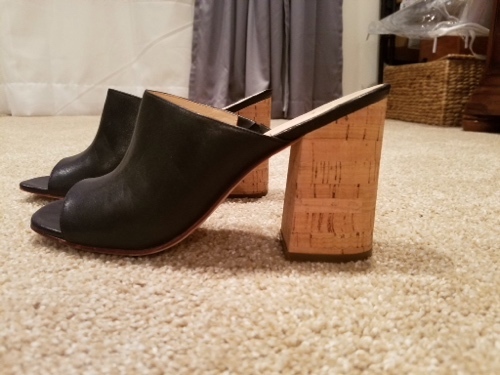 I love the mules I have with the cork heels. I found them at one of our local discount stores. They are Cole Haan and were only $50! I’m such a bargain girl. I couldn’t believe I found those, and no one had bought them yet. Don’t mind the bags under my eyes. I didn’t realize I looked so tired until now. I’m took the pictures awhile back. Just haven’t had time to write this post up. 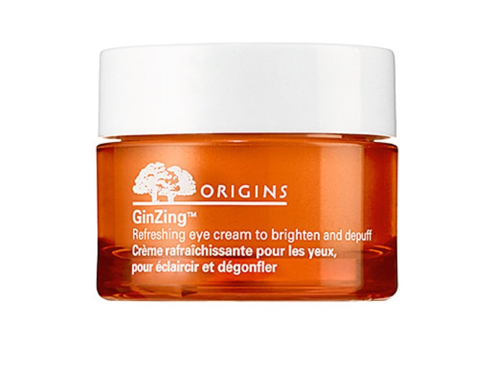 Btw, Origins has a great eye cream for bags called zinger eye cream or something like that. I’ll put a picture in here.